In 1890-91, Rochester Railway Company began electrifying its horse car lines and purchased 100 cars from Gilbert Car Manufacturing Company of Troy, New York. These cars included 354, shown in our photo which dates to the 1890s. 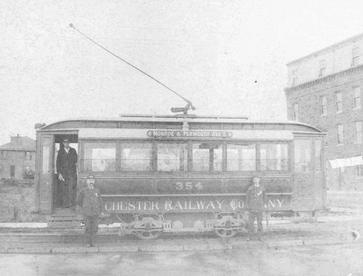 The Gilbert firm started in 1820 as a wagon and carriage builder, and began building streetcars in 1889. 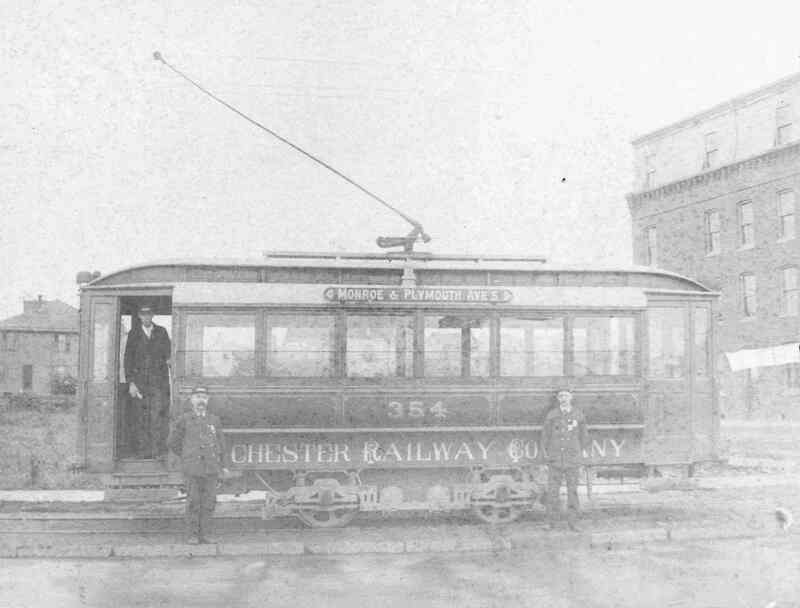 Gilbert built three closed cars that year for Rochester Electric Railway (Ridge Road to Charlotte via Lake Avenue). These cars performed well on the RER line and may have influenced RRC to use them on their city lines. The double-end, single-truck, railroad roof Gilbert cars were delivered to Rochester in several batches. An initial group, numbered in the low 100s was soon complimented by groups in the mid-150s, low 200s, low 300s, and mid-300s. Photos of these cars in their original paint with fancy “Rochester Railway Company” lettering below side windows are known for cars 112, 114, 115, 118, 119, 157, 202, 208, 310 and 354. The Gilbert cars used rheostat control and had two Short-type 15 hp. motors. Car 354 as seen here has an early Bemis truck. The cars’ enclosed vestibules were an unusual feature not to become standard in Rochester for 15 years. A very unusual feature of these cars was that they were painted in a variety of colors according to the route on which they would serve. Car 354, used on the Monroe and Plymouth line, was a chocolate brown color. Other colors were: orange on St. Paul and Sophia (later Plymouth Avenue North) line; red on East and West Main; maroon on South and Lake; green on Exchange and Joseph; gray on North and West; and blue on Lyell and University. RRC decided in early 1892 to electrify the remainder of its horse car lines. Since the 100 Gilbert cars would not satisfy the needs of the expanded system, an additional 30 cars were purchased from Stephenson. These were numbered in the mid-100s, starting with 123, so as to not interfere with any of the small groups of Gilbert car numbers. Since the narrow doorways of the Gilbert cars had hindered loading and unloading, the Stephenson cars were ordered with open platforms. With the new cars came the abandonment of the color coding of lines by car paint, a system which had made substitutions of cars on other lines nearly impossible. Patrons had refused to board cars other than those with colors of their lines. Colored paddles and lights were later used in addition to signing to identify the route on which a car was serving. The Gilbert firm had disastrously enlarged its factory in 1892, just in time for the company to be crushed out of existence in the aftermath of the Panic of 1893. Gilbert built its last cars in 1895, leaving the 103 RER and RRC Gilberts as the only ones ever to operate in Rochester. Car 354, like the rest of the 200s, had its primitive controller and motors replaced in the mid-1890s with K-controllers and modern GE800 25 hp. Motors. Its truck was probably changed at this time to a sturdier Peckham or Taylor truck. The ultimate disposition of 354 is unknown. It may have been used to build a 300-series car (lengthened 100- or 200-series single truck cars); it may have been scrapped in the early 1900s; or it may have been converted into a work car. If this latter event occurred, 354 may even have been one of those lucky Gilbert cars to survive to 1941.